In the mid-1960s, the US Air Force (USAF) was seeking an aircraft to replace its piston-engined Lockheed EC-121 Warning Star, which had been in service for over a decade. After issuing preliminary development contracts to three companies, the USAF picked Boeing to construct two airframes to test Westinghouse Electric and Hughes's competing radars. Both radars used pulse-Doppler technology, with Westinghouse's design emerging as the contract winner. Testing on the first production E-3 began in October 1975. The first USAF E-3 was delivered in March 1977, and during the next seven years, a total of 34 aircraft were manufactured. NATO, as a single identity, also had 18 aircraft manufactured, basing them in Germany. The E-3 was also sold to the United Kingdom (seven) and France (four) and Saudi Arabia (five, plus eight E-3-derived tanker aircraft). In 1991, when the last aircraft had been delivered, E-3s participated in Operation Desert Storm, playing a crucial role of directing coalition aircraft against the enemy. Throughout the aircraft's service life, numerous upgrades were performed to enhance its capabilities. In 1996, Westinghouse Electric's Defense & Electronic Systems division was acquired by Northrop Corporation, before being renamed Northrop Grumman Mission Systems, which currently supports the E-3's radar. The piston-engined EC-121 Warning Star, a military development of the Lockheed Constellation, saw service since the mid-1950s. Boeing initially proposed a purpose-built aircraft, but tests indicated it would not outperform the already-operational 707, so the latter was chosen instead. To increase endurance, this design was to be powered by eight General Electric TF34s. It would carry its radar in a rotating dome mounted at the top of a forward-swept tail, above the fuselage. Boeing was selected ahead of McDonnell Douglas's DC-8-based proposal in July 1970. Initial orders were placed for two aircraft, designated EC-137D as test beds to evaluate the two competing radars. As the test-beds did not need the same 14-hour endurance demanded of the production aircraft, the EC-137s retained the Pratt & Whitney JT3D commercial engines, and a later reduction in endurance requirement led to retaining the normal engines in production. The first EC-137 made its maiden flight on 9 February 1972, with the fly-off between the two radars taking place during March–July that year. Favorable test results led to the selection of Westinghouse's radar for the production aircraft. Hughes's radar was initially thought to be a certain winner, simply because much of its design was also going into the new F-15 Eagle's radar program. The Westinghouse radar used a pipelined fast fourier transform (FFT) to digitally resolve 128 Doppler frequencies, while Hughes's radars used analog filters based on the design for the F-15 fighter. Westinghouse's engineering team won this competition by using a programmable 18-bit computer whose software could be modified before each mission. This computer was the AN/AYK-8 design from the B-57G program, and designated AYK-8-EP1 for its much expanded memory. This radar also multiplexed a beyond-the-horizon (BTH) pulse mode that could complement the pulse-Doppler radar mode. This proved to be beneficial especially when the BTH mode is used to detect ships at sea when the radar beam is directed below the horizon. Approval was given on 26 January 1973 for full-scale development of the AWACS system. To allow further development of the aircraft's systems, orders were placed for three preproduction aircraft, the first of which performed its maiden flight in February 1975. To save costs, the endurance requirements were relaxed, allowing the new aircraft to retain the four JT3D (U.S. military designation TF33) engines. IBM and Hazeltine were selected to develop the mission computer and display system. The IBM computer was designated 4PI, and the software is written in JOVIAL. A Semi-Automatic Ground Environment (SAGE) or back-up interceptor control (BUIC) operator would immediately be at home with the track displays and tabular displays, but differences in symbology would create compatibility problems in tactical ground radar systems in Iceland, mainland Europe, and South Korea over Link-11 (TADIL-A). Modifications to the Boeing 707 for the E-3 Sentry included a rotating radar dome (rotodome), uprated hydraulics (from 3500 to 5000 PSI) to drive the rotodome, single-point ground refueling, air refueling, and a bail-out tunnel or chute. The original design had two (one forward, and one aft), but the aft bail-out chute was deleted to cut mounting costs. Engineering, test and evaluation began on the first E-3 Sentry in October 1975. Between 1977 and 1992, a total of 68 E-3s were built. Because the Boeing 707 is no longer in production, the E-3 mission package has been fitted into the Boeing E-767 for the Japan Air Self Defense Forces. The E-10 MC2A was intended to replace USAF E-3s—along with the RC-135 and the E-8, but the E-10 program was canceled by the Department of Defense. The USAF is now performing a series of incremental improvements, mainly to avionics, to bring the E-3 up to current standards of performance. Boeing is flight-testing its Block 40/45 E-3s. This modified E-3 contains upgrades of the mission crew and air battle management sections, as well as significantly upgraded electronic equipment. Another program that the Air Force is considering is the "Avionics Modernization Program" (AMP). AMP would equip the E-3s with glass cockpits. The Air Force also wants modified E-3s with jet engines that are more reliable than the original ones, and also with at least 19% higher fuel efficiencies. New turbofan engines would give these E-3s longer ranges, longer time-on-station, and a shorter critical runway length. If the modification is carried out, the E-3s could take off with full fuel loads using runways only 10,000 ft (3,000 m) long, and also at higher ambient temperatures and lower barometric pressures, such as from bases in mountainous areas. The E-8 Joint STARS briefly fitted a test aircraft with the new Pratt & Whitney JT8D-219 turbofans, stated as having one-half the cost of the competing engine, the CFM56, the Air Force is again studying the possibility of replacing the E-3's original turbofan engines with more-efficient ones. Upgrading NATO's E-3 fleet is complicated by the heterogeneity of the fleet's equipment. Each NATO member's E-3 aircraft are configured differently, and NATO has not finalized upgrade or replacement plans. The airplanes themselves can be flown to 2050 with appropriate maintenance, but as the worldwide fleet of 707 aircraft dwindles, supporting the E-3 becomes more difficult. The E-3 Sentry's airframe is a modified Boeing 707-320B Advanced model. USAF and NATO E-3s have an unrefueled range of some 4,000 mi (6,400 km) or eight hours of flying. The newer E-3 versions bought by France, Saudi Arabia, and the UK are equipped with newer CFM56-2 turbofan engines, and these can fly for about 11 hours or about 5,000 mi (8,000 km). The Sentry's range and on-station time can be increased through air-to-air refueling and the crews can work in shifts by the use of an on-board crew rest and meals area. When deployed, the E-3 monitors an assigned area of the battlefield and provides information for commanders of air operations to gain and maintain control of the battle; while as an air defense asset, E-3s can detect, identify, and track airborne enemy forces far from the boundaries of the U.S. or NATO countries and can direct fighter-interceptor aircraft to these targets. In support of air-to-ground operations, the E-3 can provide direct information needed for interdiction, reconnaissance, airlift, and close-air support for friendly ground forces. The unpressurized rotodome is 30 feet (9.1 m) in diameter, six feet (1.8 m) thick at the center, and is held 11 feet (3.4 m) above the fuselage by two struts. It is tilted down at the front to reduce its aerodynamic drag, which lessens its detrimental effect on take-offs and endurance (which is corrected electronically by both the radar and secondary surveillance radar antenna phase shifters). The rotodome uses bleed air, outside cooling doors, and fluorocarbon based cold plate cooling to maintain the electronic and mechanical equipment temperatures. The hydraulically rotated antenna system permits the Westinghouse Corporation's AN/APY-1 [uk] and AN/APY-2 passive electronically scanned array radar system to provide surveillance from the Earth's surface up into the stratosphere, over land or water. Close-up view of the radar, which revolves at six revolutions per minute. Other major subsystems in the E-3 Sentry are navigation, communications, and computers. Fourteen consoles display computer-processed data in graphic and tabular format on video screens. Console operators perform surveillance, identification, weapons control, battle management and communications functions. The radar and computer subsystems on the E-3 can gather and present broad and detailed battlefield information. This includes position and tracking information on enemy aircraft and ships, and location and status of friendly aircraft and naval vessels. The information can be sent to major command and control centers in rear areas or aboard ships. In times of crisis, data can be forwarded to the National Command Authority in the U.S. via RC-135 or naval aircraft carrier task forces. Electrical generators mounted on each of the E-3's four engines provide the one megawatt of electrical power that is required by the E-3's radars and other electronics. Its pulse-Doppler radar (PD) has a range of more than 250 mi (400 km) for low-flying targets at its operating altitude, and the pulse (BTH) radar has a range of approximately 400 mi (650 km) for aircraft flying at medium to high altitudes. The radar, combined with a secondary surveillance radar (SSR) and electronic support measures (ESM), provides a look down capability, to detect, identify, and track low-flying aircraft, while eliminating ground clutter (radar) returns. Personnel manning E-3 communications and command consoles. Starting in 1987, USAF E-3s were upgraded under the "Block 30/35 Modification Program" to enhance the E-3's capabilities. On 30 October 2001, the final airframe to be upgraded under this program was rolled out. Several major enhancements were made, firstly the installation of ESM and an electronic surveillance capability, for both active and passive means of detection. Also, Joint Tactical Information Distribution System (JTIDS) was installed, which provides rapid and secure communication for transmitting information, including target positions and identification data, to other friendly platforms. Global Positioning System (GPS) capability was also added. Onboard computers were also overhauled to accommodate JTIDS, Link-16, the new ESM systems and to provide for future enhancements. The Radar System Improvement Program (RSIP) was a joint US/NATO development program. RSIP enhances the operational capability of the E-3 radars' electronic countermeasures, and dramatically improve the system's reliability, maintainability, and availability. Essentially, this program replaced the older transistor-transistor logic (TTL) and emitter-coupled logic (MECL) electronic components, long-since out of production, with off-the-shelf digital computers that utilised a High-level programming language instead of assembly language. Significant improvement came from adding pulse compression to the pulse-Doppler mode, replacing the old 8-bit FFT with 24-bit FFTs, and the 12-bit A/D (Sign + 12-bits) with a 15-bit A/D (Sign + 15-bits). These hardware and software modifications improve the E-3 radars' performance, providing enhanced detection with an emphasis towards low radar cross-section (RCS) targets. The RAF had also joined the USAF in adding RSIP to upgrade the E-3's radars. The retrofitting of the E-3 squadrons was completed in December 2000. Along with the RSIP upgrade was installation of the Global Positioning System/Inertial Navigation Systems which dramatically improve positioning accuracy. In 2002, Boeing was awarded a contract to add RSIP to the small French AWACS squadron. Installation was completed in 2006. In 2009, the USAF, in cooperation with NATO, entered into a major flight deck avionics modernization program in order to maintain compliance with worldwide airspace mandates. The program, called DRAGON (for DMS Replacement of Avionics for Global Operation and Navigation), was awarded in 2010 – the prime was Boeing and the subcontractor was Rockwell Collins. Drawing on their Flight2 Flight Management System (FMS), almost all the existing avionics were replaced with new, more modern digital equipment from Rockwell Collins. The major upgraded capabilities include a Digital Audio Distribution System, Mode-5/ADS-B transponder, Inmarsat & VDL datalinks, and a TAWS function. The navigation system is capable of RNP-0.3, STARs and LNAV/VNAV approaches, and SIDs. The centerpiece flight deck hardware consists of five 6x8 color graphics displays (2 PFDs, 2 IMFDs, and an EICAS), two color CDUs, and a Thales ISD standby. DRAGON lays the foundation for subsequent upgrades including GPS M-Code, Iridium ATC, and Autopilot. USAF DRAGON Production begins in 2018. An RAF Boeing E-3D Sentry AEW1 accompanied by two Panavia Tornado F3s at Kemble Air Day. RAF AEW1s can be identified by the electronic support measures pods on the wingtips. In March 1977, the 552nd Airborne Warning and Control Wing (now the 552d Air Control Wing) at Tinker AFB, Oklahoma received the first E-3 aircraft, flown and commanded by Major James R. Sterk. The 34th and last USAF Sentry was delivered in June 1984. In March 1996, the USAF activated the 513th Air Control Group (513 ACG), an ACC-gained Air Force Reserve Command (AFRC) AWACS unit under the Reserve Associate Program. Collocated with the 552 ACW at Tinker AFB, the 513 ACG which performs similar duties on active duty E-3 aircraft shared with the 552 ACW. The USAF has a total of thirty-one E-3s in active service. Twenty-seven are stationed at Tinker AFB and belong to the Air Combat Command (ACC). Four are assigned to the Pacific Air Forces (PACAF) and stationed at Kadena AB, Okinawa and Elmendorf AFB, Alaska. One aircraft (TS-3) was assigned to Boeing for testing and development (retired/scrapped June 2012). In 1977, Iran placed an order for ten E-3s, however this order was cancelled following the 1979 overthrow of the Iranian government. NATO acquired 18 E-3As and support equipment for a NATO air defense force. Since all aircraft must be registered with a certain country, the decision was made to register the 18 NATO Sentries with Luxembourg, a NATO member that previously did not have any air force. The first NATO E-3 was delivered in January 1982. The eighteen E-3s were operated by Number 1, 2 and 3 Squadrons of NATO's E-3 Component, based at NATO Air Base Geilenkirchen. Presently, 16 NATO E-3As are in the inventory, since one E-3 was lost in a crash and one was retired from service in 2015. The United Kingdom and France are not part of the NATO E-3A Component, instead procuring E-3 aircraft through a joint project. The UK and France operate their E-3 aircraft independently of each other and of NATO. The UK operates six aircraft (with a seventh now retired) and France operates four aircraft, all fitted with the newer CFM56-2 engines. The British requirement came about following the cancellation of the British Aerospace Nimrod AEW3 project to replace the Avro Shackleton AEW2 during the 1980s. The UK E-3 order was placed in February 1987, with deliveries starting in 1990. The other operator of the type, delivered between June 1986 and September 1987, is Saudi Arabia which operates five aircraft, all fitted with CFM56-2 engines. This particular sale was hotly contested between the Reagan administration and opponents of the sale, mainly the Israeli lobby in the United States and their allies in Congress. E-3 Sentry aircraft were among the first to deploy during Operation Desert Shield, where they immediately established as an around-the-clock radar screen to defend against Iraqi forces. During Operation Desert Storm, E-3s flew 379 missions and logged 5,052 hours of on-station time. 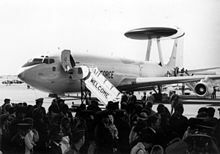 The data collection capability of the E-3 radar and computer subsystems allowed an entire air war to be recorded for the first time in history. In addition to providing senior leadership with time-critical information on the actions of enemy forces, E-3 controllers assisted in 38 of the 41 air-to-air kills recorded during the conflict. NATO E-3s joined their USAF colleagues for joint air defense as part of Operation Eagle Assist in the wake of the September 11, 2001 terrorist attacks on the World Trade Center towers and the Pentagon. NATO and RAF E-3s participated in the international military operation in Libya. On 27 January 2015, the RAF deployed an E-3D Sentry to Cyprus in support of U.S.-led coalition airstrikes against Islamic State militants in Iraq and Syria. The Sentry joins RAF Panavia Tornado, MQ-9 Reaper, and AirTanker Voyager aircraft performing or supporting almost daily strikes against militants. On 23 June 2015, the first of the original 18 NATO E-3A AWACS aircraft to retire, arrived at Davis-Monthan AFB near Tucson, AZ. The aircraft, LX-N 90449, will be placed in parts reclamation storage where critical parts will be removed by NATO technicians to support their remaining fleet of 16 Boeing E-3A aircraft. It had accumulated 22,206 flight hours between 19 August 1983 and 13 May 2015 and operated out of twenty-one different countries in support of NATO operational activities. The aircraft was due in mid-July 2015 for a six-year cycle Depot Level Maintenance (DLM) inspection which would have been very costly. Without the inspection, the aircraft would no longer be allowed to fly. The so-called "449 Retirement Project" will result in reclamation of critical parts with a value of upwards of $40,000,000. Some of the parts to be removed are no longer on the market or have become very expensive. On 18 November 2015, an E-3G was deployed to the Middle East to begin "immediately" flying combat missions in support of Operation Inherent Resolve against ISIL, marking the first combat deployment of the upgraded AWACS Block 40/45. The $2.7 billion development effort started in 2003, with the first five aircraft achieving initial operational capability (IOC) in July 2015. The Block 40/45 upgrade is the most extensive the E-3 has undergone, replacing its 1970s computer technology with an early 2000s standard and including a deployable ground system that receives, processes, and disseminates data. The Air Force plans to convert 24 AWACS to E-3G standard, while retiring seven from the fleet to avoid upgrade costs and harvest out-of-production components. Two prototype AWACS aircraft with JT3D engines, one fitted with a Westinghouse Electric radar and the other with a Hughes Aircraft Company radar. Both converted to E-3A standard with TF33 engines. Production aircraft with TF33 engines and AN/APY-1 radar, 24 built for USAF later converted to E-3B standard, total of 34 ordered but the last 9 completed as E-3C. One additional aircraft retained by Boeing for testing, 18 built for NATO with TF33 engines and five for Saudi Arabia with CFM56 engines. These are not AWACS aircraft but CFM56 powered tankers based on the E-3 design. Eight were sold to Saudi Arabia. E-3As with improvements, 24 conversions. Production aircraft with AN/APY-2 radar, additional electronic consoles and system improvements, ten built. One E-3A aircraft used by Boeing for trials later redesignated E-3C. Production aircraft for the Royal Air Force to E-3C standard with CFM56 engines and British modifications designated Sentry AEW.1, seven built. Production aircraft for the French Air Force to E-3C standard with CFM56 engines and French modifications, four built. USAF Block 40/45 modification. Includes hardware and software upgrades to improve communications, computer processing power, threat tracking, and others, and automates some previously manual functions. initial operating capability (IOC) reached in July 2015. NATO E-3s have the registration LX on the tail, as they are registered with Luxembourg. The chin bulges house a suite of electronic warfare support measures. The French Air Force purchased four E-3F aircraft similar to the British E-3D aircraft. All planes are assigned to the Escadron de Détection et de Commandement Aéroporté (ECDA, Air detection and command squadron) and are based at Avord Air Base. Based in Geilenkirchen, Germany, 18 E-3 AWACS were purchased – one lost in Greece, one retired from service. All of these aircraft are officially registered as aircraft of Luxembourg, a NATO member with no other air force. Responsible for monitoring airspace for NATO operations around the world. The Royal Saudi Air Force purchased five E-3A aircraft and eight KE-3A tanker aircraft in 1983. The Royal Air Force purchased seven E-3Ds by October 1987. Five remain in service; four are operational and one is used for training, the other two were withdrawn in March 2019. The aircraft are designated Sentry AEW.1. The United States Air Force currently has 32 E-3s. The E-3 has been involved in three hull-loss accidents, and one radar antenna destroyed during RSIP development (see photo under Avionics). On 22 September 1995, a U.S. Air Force E-3 Sentry (callsign Yukla 27, serial number 77-0354), crashed shortly after take off from Elmendorf AFB, Alaska. The plane lost power to both left side engines after these engines ingested several Canada geese during takeoff. The aircraft went down about 2 miles (3.2 km) northeast of the runway, killing all 24 crew members on board. ^ Quote:"...and the first flight of an E-3 with full mission avionics was from Seattle on 25 May 1976." ^ Eden et al 2004, p. 94. ^ a b c d e f g h i j k l m n o p q r "E-3 SENTRY (AWACS)". US Air Force. 22 September 2015. Retrieved 6 September 2017. ^ Wilson 1998, p. 72. ^ a b Eden et al. 2004, p. 92. ^ a b c Davies 2005, p. 2. ^ Simonsen, Erik (March 2007). "Still keeping watch" (PDF). Boeing. Retrieved 21 August 2011. ^ Davies 2005, pp. 5–6. ^ a b "AWACS Surveillance Radar" (PDF). Northrop Grumman. Archived from the original (PDF) on 27 February 2009. Retrieved 10 February 2009. ^ Taylor et al. 1976, p. 246. ^ Piotrowski, General Pete. Basic Airman to General: The Secret War & Other Conflicts. p. 447. ISBN 978-1-4931-6186-7. ^ Gunston, Bill (1985). The Illustrated Encyclopedia of the World's Modern Military Aircraft. Leisure Books. ISBN 978-0-517-22477-9. ^ a b c d e "Airborne Warning and Control System (AWACS)". Boeing. Archived from the original on 18 May 2007. Retrieved 26 May 2007. ^ "Completes Mission System Flight Testing for US AWACS Block 40/45 Upgrade" (Press release). Boeing. 10 September 2008. Archived from the original on 29 June 2011. Retrieved 13 July 2011. 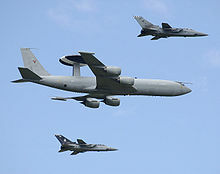 ^ "EADS, Northrop Grumman, Partt and Whitney To Offer NATO AWACS Upgrade". Defense Daily International. 13 July 2001. Archived from the original on 6 November 2012. Retrieved 8 September 2010. ^ a b "E-3 Sentry (AWACS): Specifications". globalsecurity.org. Retrieved 18 August 2011. ^ "Boeing E-3 Airborne Warning and Control System (AWACS)" (PDF). Boeing. Archived from the original (PDF) on 18 March 2006. Retrieved 22 August 2011. ^ "E-3 Sentry (AWACS)". globalsecurity.org. Retrieved 9 November 2009. ^ Wilson 1998, p. 73. ^ "E-3 Sentry (AWACS)". Federation of American Scientists. 23 April 2000. Retrieved 13 July 2011. ^ a b "E-3 Sentry (AWACS)". globalsecurity.org. Retrieved 26 May 2007. ^ a b "AWACS For United Kingdom and France". Boeing. Archived from the original on 27 February 2007. Retrieved 26 May 2007. ^ "DRAGON program to improve aging E-3". af.mil. Retrieved 14 April 2018. ^ a b c d e f g Wilson 1998, p 75. ^ a b "U.S. and NATO AWACS". Boeing. Archived from the original on 14 August 2011. Retrieved 21 August 2011. ^ "Military Safety". Flight International. 4–10 June 1997. p. 44. Retrieved 23 August 2011. ^ "AWACS For United Kingdom and France". Boeing. Archived from the original on 27 March 2011. Retrieved 26 September 2010. ^ "E-3 Specifications (707 Platform) and Worldwide Fleet". Boeing. Archived from the original on 27 March 2011. Retrieved 26 September 2010. ^ Hoyle, Craig. "RAF ISTAR watch: a Shadowy arrival, and saving Sentinel". Flightglobal. Archived from the original on 2013-07-24. Retrieved 27 September 2013. ^ Lake 2009, p. 44. ^ a b Veronico and Dunn 2004, p. 83. ^ "NATO starts patrolling Libyan air space". The Australian. 11 March 2011. Retrieved 22 August 2011. ^ "A NATO E-3A Arrives at Davis-Monthan AFB". dvidshub.net. Retrieved 14 April 2018. ^ a b "E-3 Sentry (AWACS) Variants". globalsecurity.org. Retrieved 21 August 2011. ^ Wilson 1998, p 76. ^ "Wedgetail to be RAF's new early warning radar aircraft". Royal Air Force. 22 March 2019. Archived from the original on 22 March 2019. Retrieved 23 March 2019. ^ a b c "E-3D". Royal Air Force. Archived from the original on 23 March 2019. Retrieved 23 March 2019. ^ "23 Squadron". Royal Air Force. Archived from the original on 14 January 2011. Retrieved 23 March 2019. ^ "Factsheets : 968 Expeditionary Airborne Air Control Squadron (ACC)". www.afhra.af.mil. Archived from the original on 20 April 2016. Retrieved 4 April 2016. ^ "CVR transcript Boeing E-3 USAF Yukla 27–22 SEP 1995". Aviation Safety Network. 16 October 2004. Retrieved 21 August 2011. ^ "Yukla 27". Airborne Early Warning Association. Retrieved 22 August 2011. Wikimedia Commons has media related to E-3 Sentry.